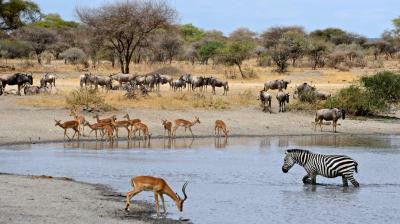 Sabi Sand is a private game reserve in South Africa. It is named after the Sabi and Sand rivers that border the place and is the refuge of elephants, rhinoceroses buffalo, leopards and other such amazing animals. Unfortunately, adventurous tourists are not the only ones attracted to Sabi Sand. Poachers know that the reserve has an abundance of rhinoceros' horns, which some actually believe can cure cancer or have magical aphrodisiac effects. A single horn may be sold sadly for $10,000 on the black market. To protect the rhinos, Sabi Sand owners try to track poachers, but their outdated paper and pen methods have not been efficient. That's why they teamed up with a mobile apps expert. Employees got android devices with GPS that take pictures and document the exact location where the animals have been killed. This paperless solution makes a timely reaction possible. Banks usually don't have wild animals to protect in branches, but paperless solutions may nonetheless speed up processes, cut costs and save trees. Research from Wausau even finds automating paper intensive processes could save banks billions "just in cost savings from courier runs alone." They point to their research that finds automation results in a 50% less need for some paper consumables, 50% less paper handling, 90% reduction in courier costs and a 50% decrease in printing as examples of benefits bankers can achieve. Community banks too can find benefits here and can start simply. For example, why not switch to paperless monthly reports to the board by using something as easy as Adobe on a tablet or laptop. Still another is by centralizing check image capture at the branch level, so employees no longer have to send paper to a central location and carriers don't need to rush physical checks over to the headquarters to meet processing deadlines. Still another area where banks are eliminating paper comes in the form of giving customer facing teams tablets to carry around. Then, when those teams visit prospective customers, they can just click and record any required information right there, demonstrate products or services to gauge customer interest, take pictures of documents if needed and shorten the whole customer capture thing down to minutes from weeks. Customers seem to really like this approach and once bankers are trained, it makes their job a lot easier too. On the lending side, paperless options have also become more widespread given the efficiency in signing online, more secure back-up and retrieval of documents, and ease of communication with customers. Here, bankers can use online compliant loan documents to record the e-signature of the customer when doing business. Customers no longer need to sit and sign document after document and can do so on their own time. Updated loan forms are available online at branches as well in case customers or sales reps prefer to meet to complete processes. Yet another option is to stop printing and shipping your annual report. See if you can switch to an electronic delivery to save money, allow your team to communicate directly with customers and to bring dull financials to life with additional bells and whistles perhaps like embedded video. Many customers already pay bills virtually, check account history online and get email reminders when a payment is due. Bankers should take a look around to see if there is anything internally that can be done to improve efficiencies as well. Just to put a smile on your face as you begin this project, consider this saying from the animal world - dogs have owners, cats have staff. Yields ticked up 2bp in response to an increase in existing home sales indicating some strength in consumers. Research by Javelin and KPMG finds transaction costs are up to 43 times higher in a branch than a mobile channel. Research by RR Donnelley on M&A transactions finds the biggest challenges with maintaining effective communication with the target company during a deal are: unwillingness to share information on the part of target company personnel (50%), convincing non-management personnel at the target to communicate openly (34%), culture clashes with target company management (30%), chronic delays in receiving responses to requests or questions (26%) and geographical limitations such as different time zones (22%). Research by TimeTrade finds comparing service enhancements Baby boomers want from banks vs. Millennials are as follows: ability to bank after hours (64% for Boomers vs. 71% for Millennials), ability to have a pre-booked appointment (39% vs. 53%) and an ability to have a video call from home with a financial advisor (9% vs. 26%). Something to think about perhaps as you do strategic planning this year. Research by Bank of America Merrill Lynch projects adoption of robots and artificial intelligence could boost productivity by 30% in many industries. A Deloitte survey of CFOs at major companies finds the major factors indicated that are most affecting business planning are: continuing low interest rates, strong US dollar, slow European economic growth, slow or slowing Chinese growth and conclusion of the US presidential election. Research by Fiserv finds consumers accessed their financial institution the following times over the prior 6 months: website (22x), mobile app (11x), ATM (9x), branch (6x) and phone (3x).